Beer batters serve a purpose…simply put, they are used for their slowly bursting bubbles. Beer is saturated with CO2 which creates bubbles to lighten up a batter, kind of like baking soda in a baked good. When the batter hits hot oil, the CO2 solubility lower and bubbles froth up, making the batter expand, lighten and become crispy. So why beer? Why not champagne or even carbonated water? You can of course replace the beer with carbonated water but the advantage that beer has can be found in the same reason why beer forms a long lasting head when poured – naturally occuring proteins and foaming agents form a film around the bubbles and slow down the rate at which they burst. In a batter, it creates a light layered crisp. Yet at the same time, alcohol evaporates faster than water and as a result, the batter cooks much faster and there is less risk of overcooking the food. In this case, the avocado – an avocado perfectly cooked is rich in flavor as the natural avocado oil is released. Overcooked and it starts to taste a bit funky. 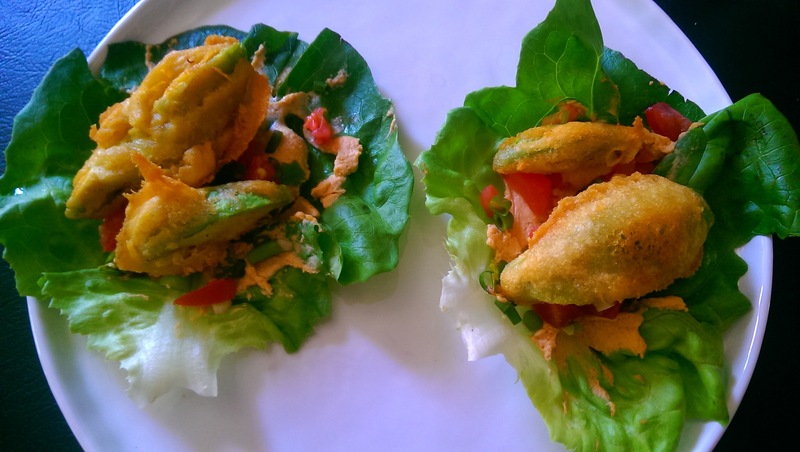 The result of a beer batter is the perfect crunch with a perfectly creamy avocado center. I used a gluten free vegan IPA, but feel free to use what you want. 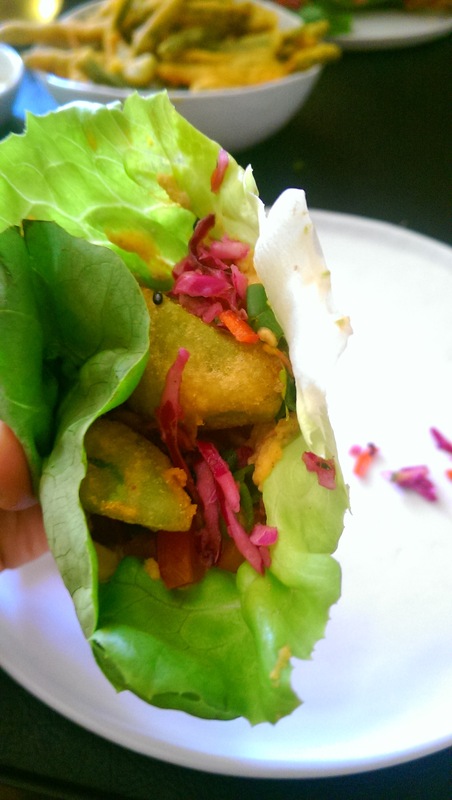 You can achieve a tasty fried avocado using carbonated water. It won’t be exactly the same, but it will be close enough. 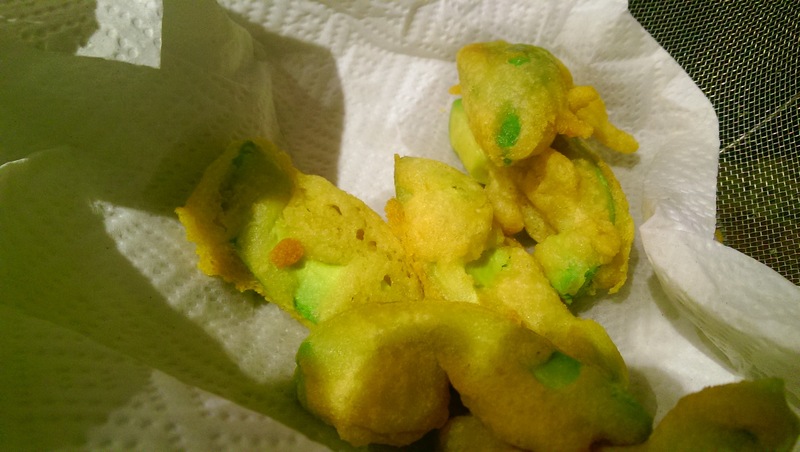 For the breading, I was reminded of batter that my mom uses to make an indian fried vegetable appetizer called pakora which is typically done with a garbanzo bean flour – it offers a sweet rich flavor to the vegetable with a nice crunch that holds up well. It also adds protein and dietary fiber. 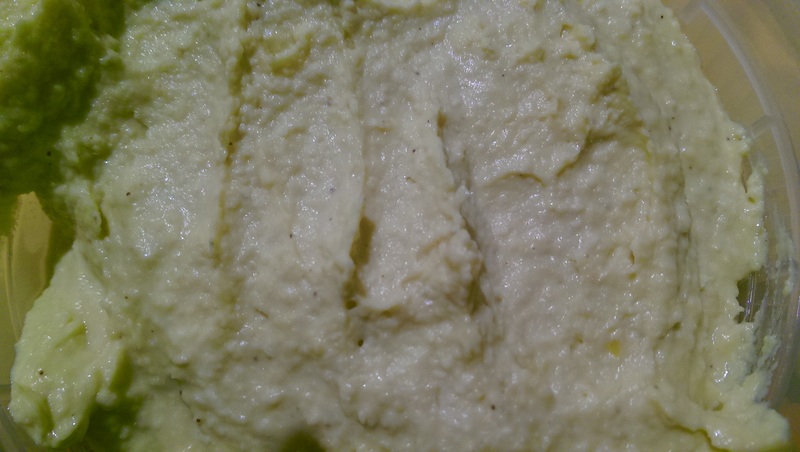 So I used a garbanzo/fava bean flour from Bob’s Red Mill. 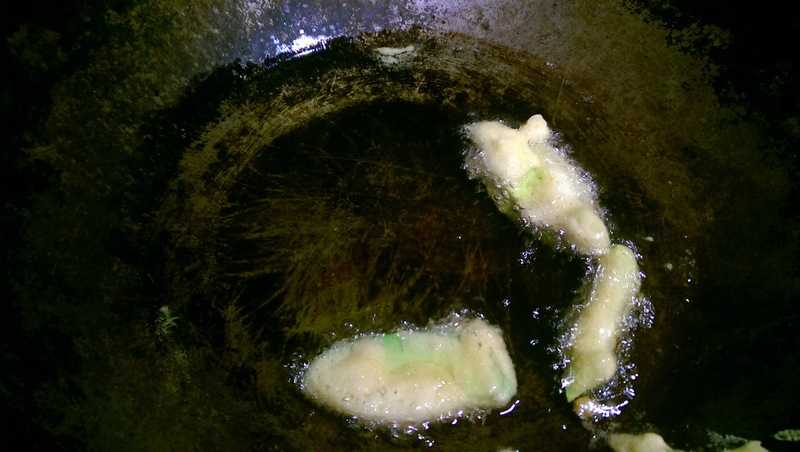 The most important aspect to consider when frying is the oil – you should use a high heat oil so that the oil does not reach the smoke point (the point at which the fat breaks down) and become rancid during the cooking process. Spectrum Natural oils provide a smoke point guide on the bottles of oils. 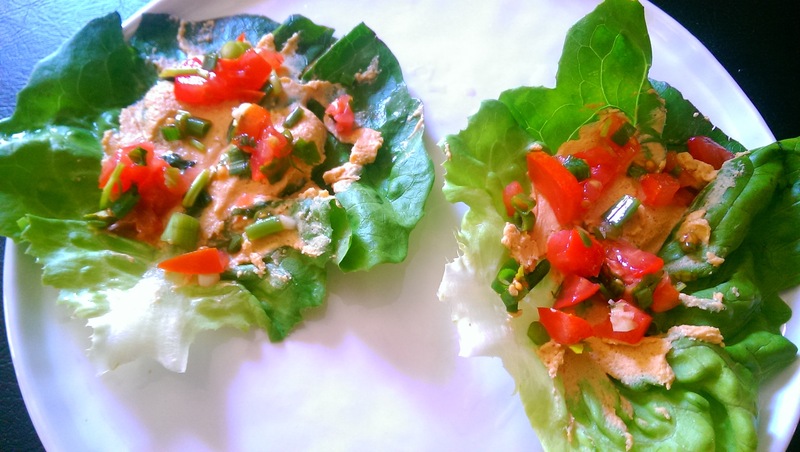 I wanted to add flavor, spice, veg and acid as well as protein and a creamy sauce to the taco. All the additional components – sauces and slaws – are pretty simple to make with a food processor. I made a cabbage zucchini slaw with carrot, lime, sesame seeds and dates for sweetness, instead of a refined sugar. Rather than puree dates on demand, I keep a “date paste” in the fridge – I take 1 cup of pitted dates and puree with 1/2 cup to 1 cup of hot water until it is blended and store it in a glass jar in the fridge. I cup of dates replaces 1 cup of sugar in baking. I use 1 Tbs of date paste as a replacement for 1 Tbs of sugar. 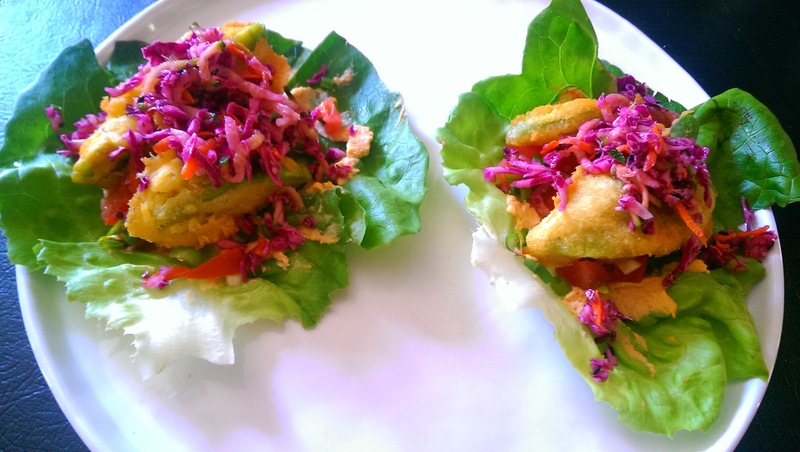 I used purple cabbage for the pop of color. I made this the night before as to let the flavors deepen and mingle. 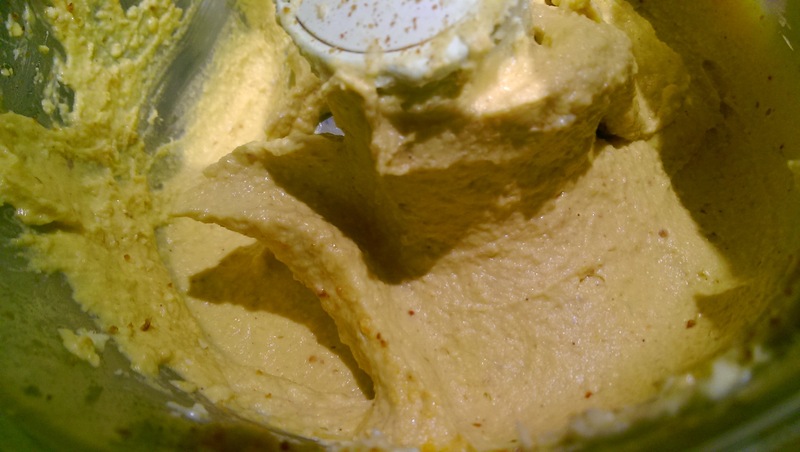 For the sirracha “aioli”, I first made a cashew nut “hummus”, then using part of the hummus, made an “aioli” adding more spices, lemon juice, coconut vinegar and sirracha. This was great fresh, even better when left to sit overnight. 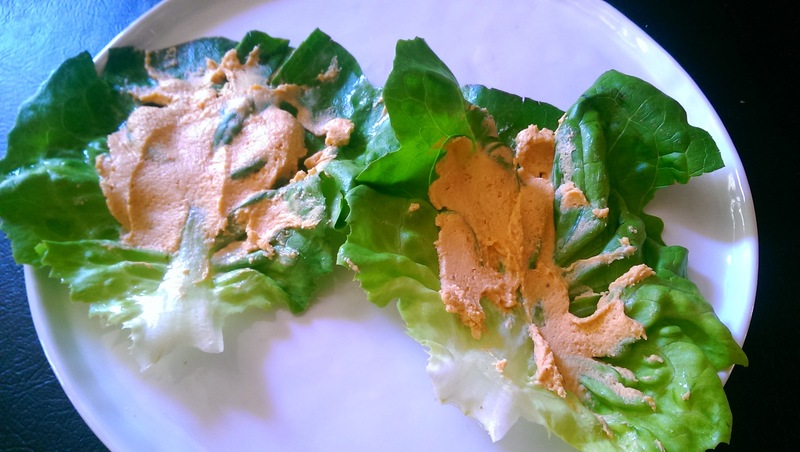 I layered the sriracha “aioli” onto the lettuce (I prefer butter lettuce, but romaine works well too). I added a quick hommade pico de gallo using tomatoes and jalepenos we grew and limes from a neighbor’s tree. 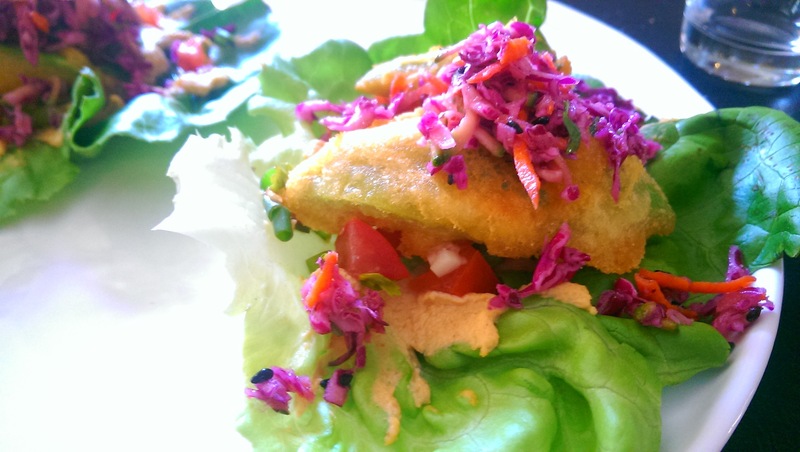 The add on the fried avocado..
and dig into your avo-taco. 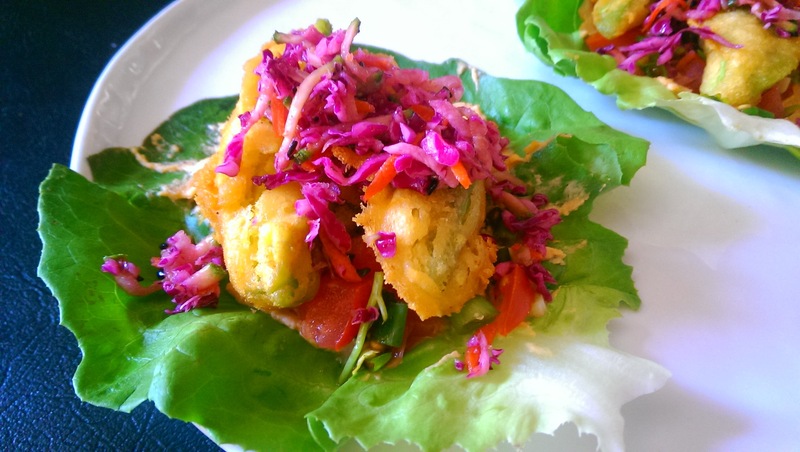 Crispy, creamy, spicy, fresh, bright and tasty with no refined sugars. 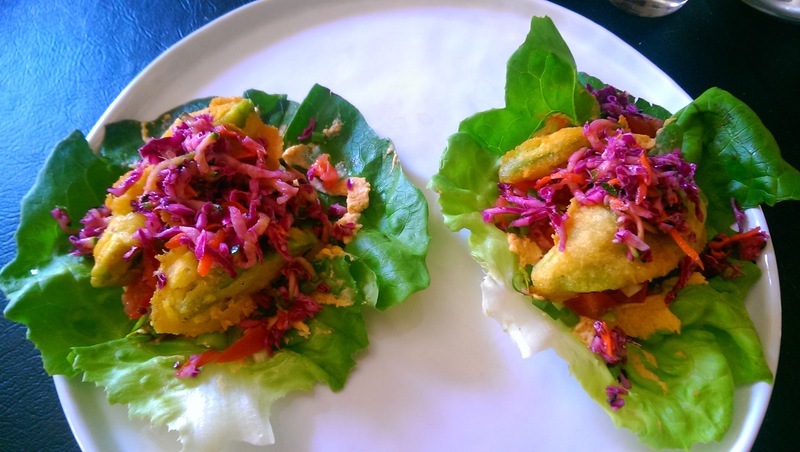 Summer may be coming to an end but there is still the perfect weather for a beer and yummy avo-tacos. 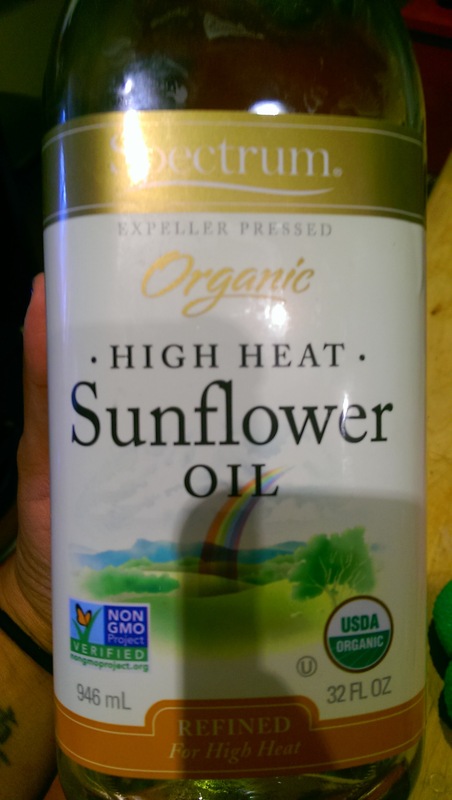 Heat oil in a wok or large saucepan – about 4 inces deep. Best if you can use a deep-fry thermometer onto the side (make sure the needle is not touching the bottom of the pot. Bring to 375-400 degrees (adjust heat to maintain that temperature). 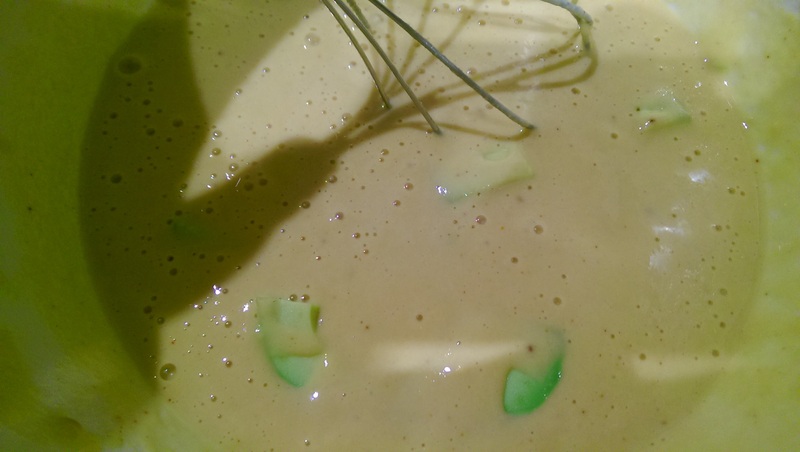 In a large bowl whisk together the flour, baking soda, salt, garlic powder, onion powder and cayenne. Add the beer and mix until combined – it should have the consistency of pancake batter. 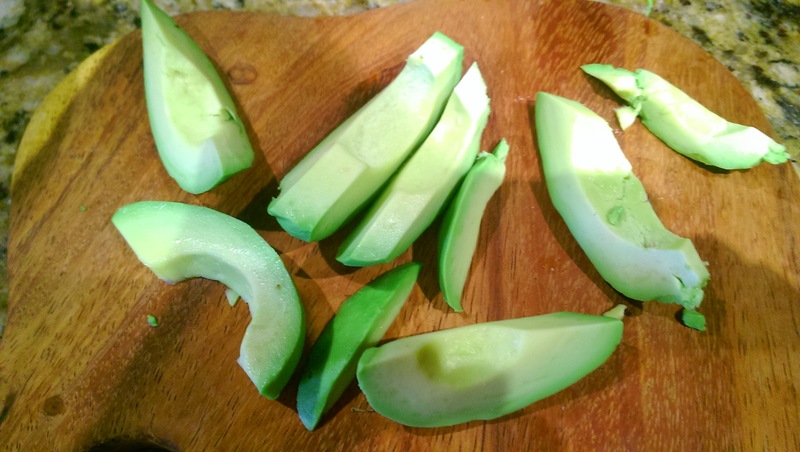 Cut the avocados into half and remove the seed. Cut the half into thick slices – about 4-5 per half and remove skin. 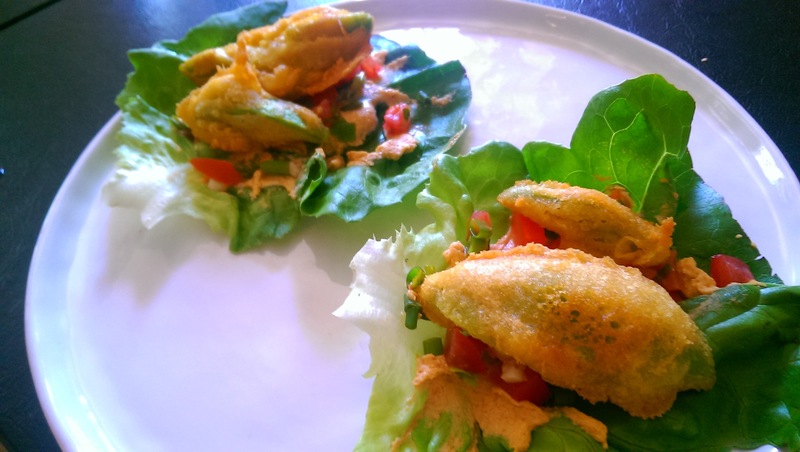 Dip the avocado slices into the batter and fry 2-3 slices for about 1-2 minutes, flip and fry until golden brown, about an additional 1-2 minutes. Remove from oil and allow to drain on a stack of paper towels. Place ingredients into a food processor and blend until creamy, pushing down the sides every so often. Taste and adjust salt and sirracha according to taste. Let sit for 2-3 hours to overnight in fridge. Place ingredients into a food processor and blend until creamy, pushing down the sides every so often. Add additional oil as needed to help blend, blending will take 5- 10 min for creaminess. Mix ingredients into a bowl. Let sit in fridge for 2-3 hours to overnight. Mix date, lime juice, olive oil, vinegar, salt, and ginger and set aside. 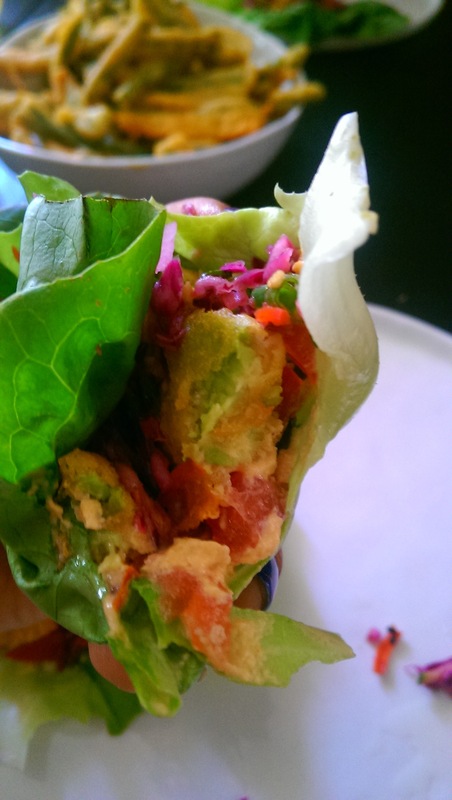 Mix cabbage, carrot, zucchini, jalepeno, cilantro and sesame seeds together. Add liquid mix and mix thoroughly. Let sit in fridge for 2-3 hours to overnight. This is amazing. Have you tried coconut oil for cooking? Yes I love coconut oil and use it all the time. Depending on the recipe sometimes I use other oils because it can impart more flavor than some oils or ghee.